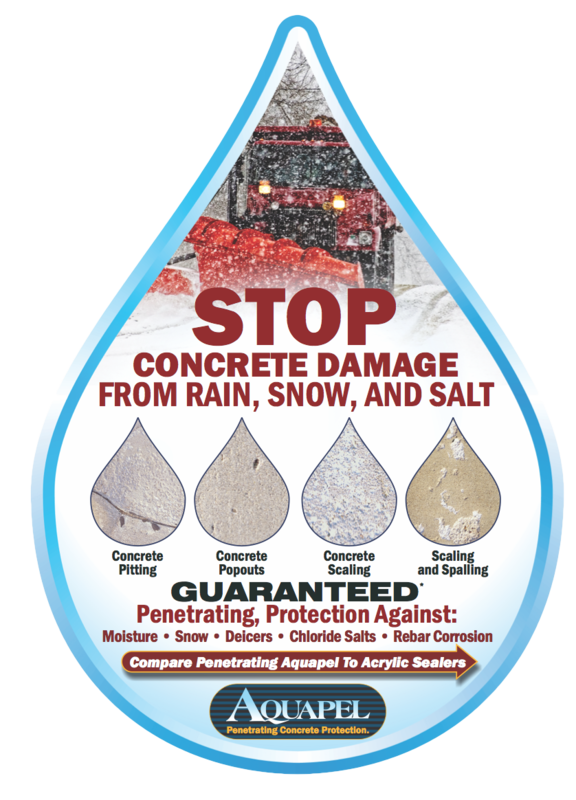 The Duke Company is proud to carry Aquapel Plus, renown heavy-duty concrete sealer and water repellant that protects concrete from the damage caused by rain, snow and salt. Prompt delivery and convenient pick-up in Rochester NY, Ithaca NY and Western New York. Heavy duty formulation, Aquapel Plus is a renown concrete sealer and water repellent. It is derived from the same low-VOC, environmentally friendly and lang lasting Aquapel, but with a substantially greater concentration for high solids. Aquapel Plus is specifically engineered for high solids and even longer-term essential protection for concrete that is porous, concrete slaps that are bear traffic and concrete surfaces that have frequent and severe exposure to the harmful effects of salt and water. Aquapel Plus is also very effective in protecting a wide range of surfaces including concrete pavers, brick pavers and other aggregate concrete surfaces. The Duke Company, a leading Building Products, Construction Materials and Equipment Rental company offers prompt delivery and convenient pick-up of this professional grate concrete sealer and water repellant. Aquapel plus is engineered to be VOC compliant, and without odor. Notably, Aquapel plus vastly surfaces the NCHRP 244, Series 2 test and is effective in limiting salt penetration and water penetration by 85 percent. This professional grade water repellant and concrete sealer is backed-up by an impressive warranty of 10 years when installed by an L&M approved installer.